We are delighted to announce our 2019 pantomime, Aladdin, written and directed by Ben Crocker. 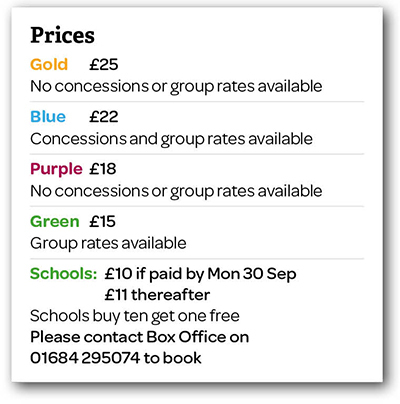 Concessions (available on blue performances): £2 off to children aged 3 – 15, to people receiving a state pension, those in receipt of Universal Credit or other documented benefits. You may be required to prove eligibility. Under 3s go free, provided they sit on a parent or guardian’s lap. Families (available on blue performances): £2 off adult tickets for parties of 3-9 when the group includes at least 1 child. Under 3s go free, provided they sit on a parent or guardian’s lap. Groups (available on blue and green performances): Buy 10 get 1 free. Please contact Box Office on 01684 295074 to book. How long is the panto? It's usually around 2hrs 20mins, including an interval. It can vary slightly though because of the nature of pantomime! Panto is most suitable for children aged 4 and above, who have some understanding of what's going on. Children under the age of 3 are welcome though, and come free if they sit on a parent's lap. Do you provide booster seats? No, but you are most welcome to bring your own. We cast professional actors, many of whom return many times. We will announce the cast of 2019 as soon as we can but you can expect to see some familiar faces coming back! The Roses' 2019 Pantomime is now on sale!